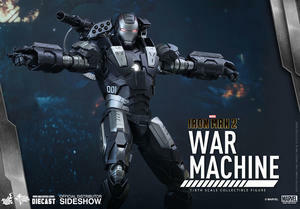 The original War Machine in Iron Man 2 was one of the most iconic Iron Man suits of all time! Its heavily weaponized configuration and powerful militaristic design are beloved by many fans worldwide. 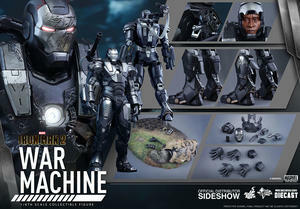 Sideshow Collectibles and Hot Toys are very excited to revisit this fan-favorite suit and present the all new War Machine sixth scale collectible figure from the MMS Diecast Series! 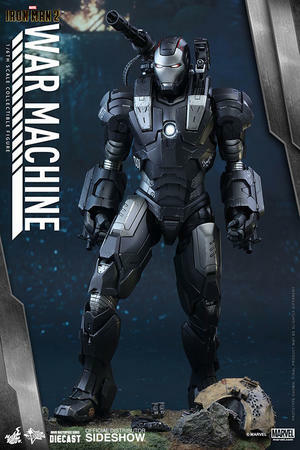 The movie-accurate collectible figure is made of diecast material and crafted with amazing details that astonish fans with its high level of authenticity! Over 32cm tall, this diecast figure has a wide range of features including a newly developed helmeted head sculpt of James Rhodes featuring a likeness of Don Cheadle, interchangeable LED light-up helmet, movie-accurate proportion and detailed armor design, metallic black and silver colored armor, interchangeable battle damaged armor parts on head, shoulder, chest, and back, articulated back-mounted machine gun, interchangeable battle damaged back-mounted machine gun barrel, hidden compartments on shoulders to reveal weapons, LED light-up functions, and a specially designed diorama figure stand based on the final showdown with Whiplash Mark II in Iron Man 2.